An American tourist saved the day when he tackled a would-be art thief wielding a hammer. The thief tried unsuccessfully to smash through the glass protecting an ancient document called the "Magna Carta" but thankfully, Matt Delcambre, of Little Iberia, Louisiana was there to tackle the thief and hold him down until help arrived. The "Magna Carta" or "Great Charter" is a legendary artifact from the year 1215 and lays out the basic rights that people wanted from the King of England. There are only four original copies of the charter that remain in existence, two at the British Library, one at Lincoln Cathedral and one at Salisbury Cathedral. You can't just walk into the Salisbury Cathedral, smash the glass out with a hammer and walk out with the Magna Carta. One would think security at Salisbury would be highly scrutinous of someone wielding a hammer in their Cathedral. 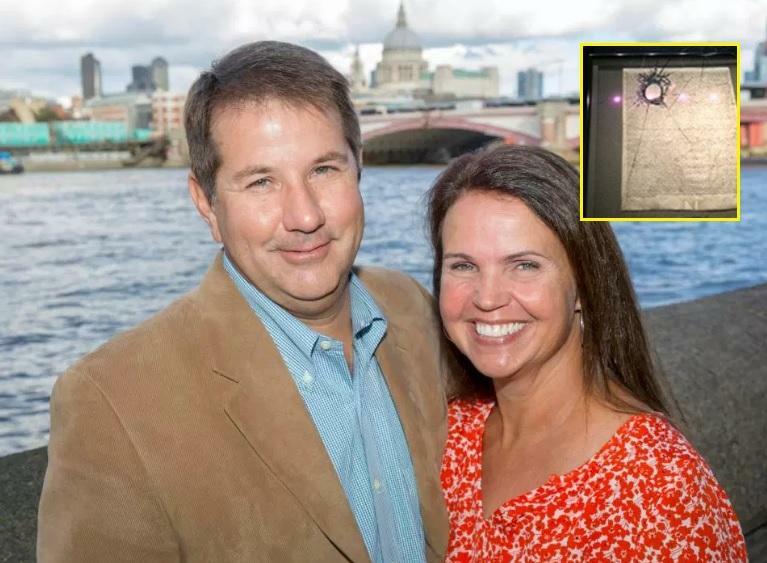 The tourist said he and his wife Alexis were sightseeing in Salisbury and happened to witness a man trying to shatter the glass casing of an ancient document with a hammer. The smashing of the glass set off an alarm in the Chapter House building, and when the thief tried to get away in the commotion, Delcambre was there to make sure he didn't go anywhere. Delcambre is 56-years-old and said, "I just had to stop him." It just so happens that Delcambre is the director of the Center for Business & Information Technologies at the University of Louisiana at Lafayette. The Magna Carta made it through the ordeal unscathed as it was protected by not one but two layers of thick glass. To his credit, the thief did manage to break a few holes in it before giving up. "Back home he would have been hog-tied on the ground," Delcambre's wife Alexis said. During the commotion, her husband described the atmosphere as he held down the thief saying, "There was a lot of confusion but no panic or screaming. It was very English." Twitter users jokingly compared the heist attempt to the film "National Treasure" where Nicolas Cage steals the Declaration of Independence. The charter of rights was first agreed to by King John of England at Runnymede near Windsor on June 15, 1215. It was first drafted by the Archbishop of Canterbury to establish peace between the King and a group of barons who were tired of being overtaxed and mistreated. Police arrested the thief thanks to Delcambre who said he did it because "The Magna Carta is one of the most important documents in the world." The whole incident unfolded around 4:45 p.m. Thursday at the Salisbury Cathedral. The 800-year-old document is safe for now, and any future thief's inspired by Nicolas Cage now know they will have to break through two layers of security glass. The Salisbury Cathedral has been in headlines recently when two Russians who were accused of poisoning the Skirpals said they were only in the city to visit the Cathedral. The Dean of the building said, "Matt acted very courageously, and I’m hugely grateful." The 45-year-old suspect was taken into custody, but his identity has not been released.